Register Now for the 2013 President’s/Leukemia Cup! Registration is now open for the 2013 President’s/Leukemia Cup Regatta. You can register for the regatta and sign up to raise funds for the Leukemia & Lymphoma Society (optional, but encouraged!) using the registration form on the PRSA President’s/Leukemia Cup Regatta Webpage. The NOR as well as information on prizes and fundraising incentives from the LLS, has also been posted to the regatta webpage. Early registration is a huge help for the regatta planners, so sign up now! Any boat that raises $100 before the regatta will be eligible for LLS racing awards based on your Saturday finishes as well as additional prizes and incentives from the LLS. Raise more than $100 and you’ll receive additional prizes and goodies from the LLS. You can request a fundraising webpage from the LLS right on the PRSA registration form, or you can bring cash/check donations to the regatta and turn them in at on-site registration. Please contact your PRSA Liaison to the LLS, Aaron Boesenecker, with any questions (apb99@mac.com). Follow this link for some excellent photos of the racing taken by Carl Schaefer during the 77th Annual President’s/Leukemia Cup. Many thanks to Carl for volunteering his time, as well as to Whit Overstreet from Potomac Riverkeeper for the use of their boat as a photograph platform during the regatta. If you wish to use these pix for marketing, for posting online, or for any other commercial purpose other than for private viewing, please contact Carl (cgschaefer@gmail.com). At a minimum, picture credit should be attributed to Carl G. Schaefer, Jr, Copyright 2011. Sat. May 21 – Leukemia/Lymphoma Society Kickoff Party! The fall might seem a long way off, but it is never to soon to start thinking about the President’s/Leukemia Cup Regatta! 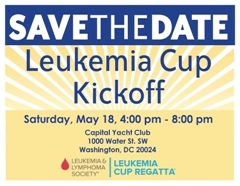 I’m writing as your PRSA liaison to the Leukemia and Lymphoma Society (LLS) to send along a bit of information–most importantly, the fact that the LLS Kickoff Party will be held this coming Saturday, May 21, 4:00 p.m., at Capitol Yacht Club (1000 Water Street SW). The weather is supposed to be great, and the party is FREE, so join us for free food (a burger & hot dog bar along with treats from Phillips Seafood), drinks (1 free drink + cash bar), live music, and lots of fun. If you were active in raising funds for LLS in the past, you should have received an Evite invitation for the event that you can use to RSVP. Otherwise, you can RSVP directly to me or to Kaitlin McTighe at LLS (Kaitlin.McTighe@…). This is a great party, and all are welcome no matter whether or not you’ve participated in fundraising in the past! In addition to a great party with lots of other sailors from the region, you’ll have the chance to register to raise funds for the LLS (with just $100 in fundraising your boat name will appear on the regatta t-shirt!). Registering will also put you in the running for some great raffle prizes, including some Mount Gay paraphernalia! Last year, PRSA won the LLS award for the Club with the most boats/teams raising $100 or more at the President’s/Leukemia Cup, and we’d love to repeat that performance. To read more about this year’s LLS events, visit http://www.leukemiacup.org/nca . Finally, the PRSA President’s/Leukemia Cup website (http://www.potomacriversailing.org/PresidentsLeukemiaCups/) is now active and will be updated with additional information, the President’s/Leukemia Cup Regatta Entry Form, and other details as the regatta approaches. As in past years, the regatta weekend will begin with the LLS Friday night party on September 9. One design boats will then race on both Saturday and Sunday, Sept. 10-11 (or just on Saturday in the case of the lower course fleets), in keeping with the PRSA President’s Cup Tradition. If you have any questions about the event in general, about fundraising for LLS, or anything else, please do not hesitate to contact me (apb99@…) or your PRSA Board Members. P.S. – please be aware that parking around the CYC is difficult. There is a garage located under Phillips Seafood if you are driving or it’s a short walk from the metro. If you would like to come via boat please indicate that in your response so CYC can coordinate in advance. Please tie up at our dinghy dock, which is all the way on the inside of the fairway between C and D docks. If you have a handheld, please hail CYC on 16 as you approach. You can also call Tom from CYC on his cellphone 571-276-7426. The dinghy dock CYC is after ganplank, and before the fishmarket going up the channel.